For the television series, see Green Eggs and Ham (TV series). For the video game, see Dr. Seuss: Green Eggs and Ham (video game). Green Eggs and Ham is a children's book by Dr. Seuss, first published on August 12, 1960. As of 2016, the book has sold 8 million copies worldwide. The story has appeared in several adaptations starting with 1973's Dr. Seuss on the Loose starring Paul Winchell as the voice of both Sam-I-am and the first-person narrator. 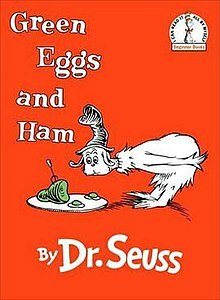 The story follows an unnamed character who does not like green eggs and ham and his adversary Sam-I-Am who wants him to eat it. The story becomes a refrain as Sam persistently follows his rival through an assortment of locations (in a house, in a box, in a car, in a tree, on a train, in the dark, in the rain, on a boat) and dining partners (a mouse, a fox, and a goat). The character finally gives in and tries the dish, just to make Sam “let him be”, and finds it quite tasty, happily responding, "I do so like green eggs and ham. Thank you. Thank you, Sam-I-am." Green Eggs and Ham is one of Seuss's "Beginner Books", written with very simple vocabulary for beginning readers. The vocabulary of the text consists of just 50 words and was the result of a bet between Seuss and Bennett Cerf, Dr. Seuss's publisher, that Seuss (after completing The Cat in the Hat using 236 words) could not complete an entire book without exceeding that limit. The 50 words are: a, am, and, anywhere, are, be, boat, box, car, could, dark, do, eat, eggs, fox, goat, good, green, ham, here, house, I, if, in, let, like, may, me, mouse, not, on, or, rain, Sam, say, see, so, thank, that, the, them, there, they, train, tree, try, will, with, would, you. Green Eggs and Ham was published on August 12, 1960. By 2001, it had become the fourth-best selling English-language children's hardcover book of all time. As of 2014, the book has sold 8 million copies. In 1999 the National Education Association (NEA) conducted an online survey of children and teachers, seeking the 100 most popular children's books. The children ranked Green Eggs and Ham third, just above another Dr. Seuss book, The Cat in the Hat. The teachers ranked it fourth. Teachers ranked it fourth again in a 2007 NEA poll. Scholastic Parent & Child magazine placed it #7 among the "100 Greatest Books for Kids" in 2012. That same year, it was ranked number 12 among the "Top 100 Picture Books" in a survey published by School Library Journal – the first of five Dr. Seuss books on the list. The book has become sufficiently ingrained in the cultural consciousness that U.S. District Court Judge James Muirhead referenced Green Eggs and Ham in his September 21, 2007 court ruling after receiving an egg in the mail from prisoner Charles Jay Wolff who was protesting against the prison diet. Muirhead ordered the egg destroyed and rendered his judgment in the style of Seuss. Senator Ted Cruz read the book on the floor of the United States Senate during his filibuster over the funding over Obamacare. Musician will.i.am has stated that his moniker is inspired by the story. On September 29, 1991, following Dr. Seuss' death earlier that week, the Reverend Jesse Jackson recited an excerpt of Green Eggs and Ham on Saturday Night Live during a special tribute segment. The character also appeared in Fox in Socks with a few changes to him, such as no hat. The song "Green Eggs and Ham" was recorded by the band Moxy Früvous on their 1992 independent debut album Moxy Früvous and is a rap treatment of the famous story. The book was also made into a Living Books adaptation for the PC and there were similar differences to reflect the new media such as Sam-I-Am sings his opening lines. An upcoming animated television series based on the book, Green Eggs and Ham, will premiere on Netflix in 2019, produced by Warner Bros. Animation, A Very Good Production, A Stern Talking To, Random House Children's Entertainment and Gulfstream Television and distributed by Warner Bros. Television. The book was also featured as one of the segments brought to life via live-action in a stage-play fashion in the 1994 TV film In Search of Dr. Seuss. In VHS/DVD, The book had included two other stories, The Tooth Book & Ten Apples Up On Top. ^ "20 Best-Selling Children's Books of All Time". HowStuffWorks. 9 December 2011. ^ "Dr. Seuss on the Loose". IMDB. Retrieved December 2, 2013. ^ a b c "10 stories behind Dr. Seuss stories". CNN. January 23, 2009. Retrieved 2009-01-26. ^ "Green Eggs and Ham". snopes.com. 2012. Retrieved May 4, 2012. ^ "99 Interesting Facts about the world #18". All That is Interesting. Retrieved 22 January 2015. ^ Daven, Hiskey (24 May 2011). "Dr. Seuss Wrote "Green Eggs and Ham" on a Bet that He Couldn't Write a Book with 50 or Fewer Words". TodayIFoundOut.com. ^ A 50 -year feast in 50 words Archived 2010-08-15 at the Wayback Machine, Marketplace. Retrieved 13 August 2010. ^ "Happy Birthday Sam-I-Am! 50 Years of Green Eggs and Ham". Gnews. 2012. Archived from the original on March 4, 2012. Retrieved May 4, 2012. ^ "All-Time Bestselling Children's Books". Publishers Weekly. 17 December 2001. Archived from the original on December 25, 2005. ^ Menand, Louis. "A Critic at Large: Cat People: What Dr. Seuss Really Taught Us". The New Yorker. 23 December 2002. ^ Kids' top 100 books Archived 2013-02-01 at the Wayback Machine NEA: National Education Association. Retrieved 26 November 2006. ^ "Teachers' Top 100 Books". NEA: National Education Association. Retrieved 26 November 2006. ^ National Education Association (2007). "Teachers' Top 100 Books for Children". Retrieved August 19, 2012. ^ "Parent & Child 100 Greatest Books for Kids" (PDF). Scholastic Corporation. 2012. Retrieved March 25, 2013. ^ Bird, Elizabeth (July 6, 2012). "Top 100 Picture Books Poll Results". A Fuse #8 Production. Blog. School Library Journal (blog.schoollibraryjournal.com). Retrieved August 19, 2012. ^ "Judge makes 'Green Eggs and Ham' ruling". MSNBC. ^ Fitzpatrick, Meagan (25 Sep 2013). "Why Ted Cruz read Green Eggs and Ham in the U.S. Senate". CBC. ^ Solomon, Deborah (20 January 2011). "Questions for Will.i.am". New York Times – via NYTimes.com. ^ Maggin, Alice (2010-08-13). "Dr. Seuss' 'Green Eggs and Ham' Turns 50". ABC News. ^ Andreeva, Nellie (April 29, 2015). "Netflix Picks Up 'Green Eggs and Ham' Animated Series From Ellen DeGeneres". Deadline. Retrieved April 30, 2015. Claasen, Lynda (16 January 2015). How Dr. Seuss Created Green Eggs and Ham (Video).